“What’s this I hear about you clogging me?” These were the first words out of Bud’s mouth upon arrival to Birmingham. “Yes, I’ve heard you’ve been clogging me… and I don’t like it.” ohhhhhh, blogging! Alas, word has gotten to Bud I’ve been blogging about him. Of course he doesn’t like it. I had to tell him he’s the most interesting person I know and if he “freezes me out” (which is what he threatened to do) than my clog… I mean, blog…fails. 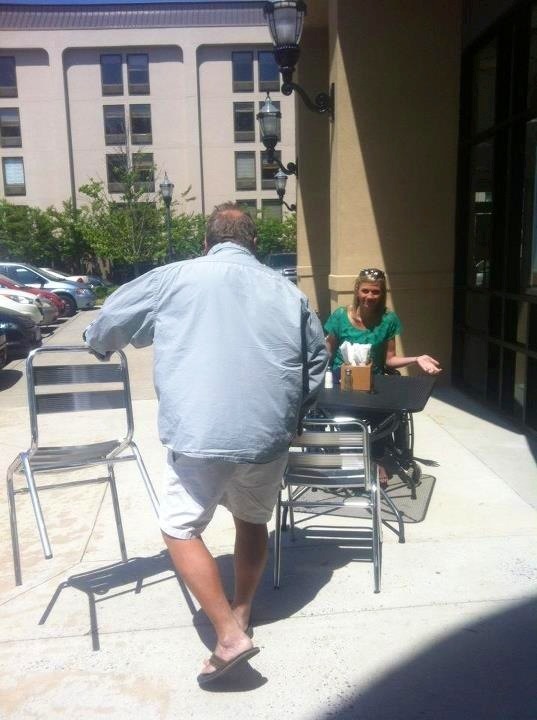 Since Bud is in town, I am completely caught up on “The Deadliest Catch.” We also went to lunch yesterday with Natalie, where he insisted on moving the table 70 ft. in front of the neighboring Verizon Store. No joke, we were directly in front of the store’s entrance. Bud doesn’t give a rip. 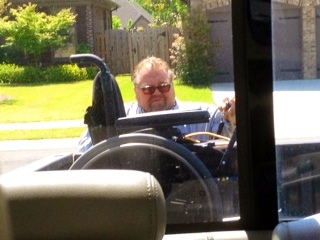 Bud also doesn’t believe in breaking down my wheelchair so it fits conveniently in the truck. He prefers to strap it down in the back, Beverly Hillbillies style. Bud doesn’t give a rip.